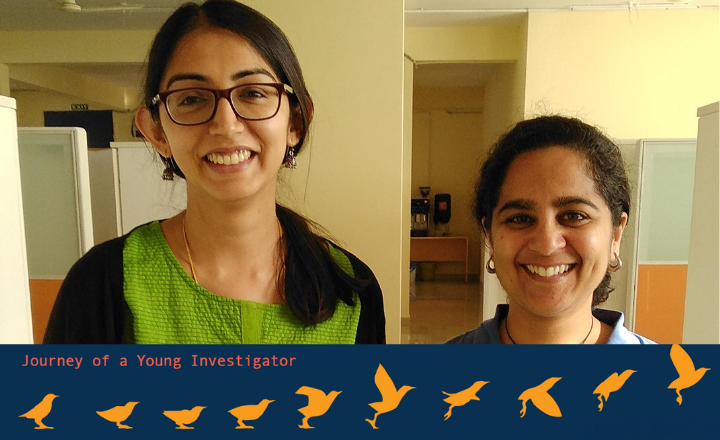 Sravanti Uppaluri and Divya Uma are faculty members at Azim Premji University, Bengaluru. In this invited article, they write about their experience of working with undergraduates, and how using research as a pedagogical tool enriches undergraduate education. After many years of research training, we all start to think of how we can contribute to the scientific community. How can we best utilize our training? Which environment will allow us to thrive? The path to finding a suitable niche wasn’t immediately clear for either of us. Research and teaching are deeply intertwined, and have been artificially separated in some institutions – this is especially the case in undergraduate institutions. Yet the skills that are required to do research are precisely what students should be developing at all stages of their education – observation, critical engagement with data, suggesting alternative interpretations – to name a few. These are skill sets that are useful not just to scientists but all citizens. Joining as faculty members at Azim Premji University (APU) within the undergraduate programme has given us the opportunity to continue pursuing a research career, albeit one in which progress has to be measured in unique and perhaps unorthodox ways. It is also a career that is deeply rewarding. Using research as a pedagogical tool, students have the opportunity to learn by questioning, rather than passively receiving knowledge, and are better prepared for any kind of career. Undergraduate research projects can be run through more formal avenues such as honour projects with a fixed duration and expectations, or informal ones in which outcomes do not have to be clearly planned and may serve as exploratory pilot studies. Working with undergraduates in the discovery process is uncharted territory for most young investigators. At best we may have been teaching assistants, or mentored undergraduate thesis projects during our postdocs. But these teaching experiences are rarely seen as paths to actually doing research in the sense of knowledge production, and rarely contribute to our own research careers. Yet, undergraduates don’t come with as many preconceived notions and serve as a truly creative pool for scientific inquiry. Combined with the intellectual freedom we have at our institution, these two factors allow us to ask some rather unconventional questions. At APU, we have leveraged the diverse student body as well as the eclectic set of interests of the faculty (we are integrated in a liberal studies programme with colleagues from all disciplines – from psychology to physics to economics to humanities) to develop an equally eclectic set of research questions. Recently one of our students wanted to understand how “identical” progeny arising from asexual reproduction in multicellular organisms are. We worked together to hone the question and choose one specific characteristic that could be tested within our infrastructural constraints and ended up asking whether associative conditioning and memory is passed on to progeny. Since Planaria have incredible regenerative potential, we used amputations to produce progeny rather asexual reproduction. The challenge, of course, is that a lot of foundational work has to be done when working with undergraduates when compared to graduate students. They require a lot more mentoring in reading and interpreting literature, they do not come with any experimental expertise (lab or field), and they often have difficulty evaluating the feasibility of a project. An additional challenge is of time scales — a conventional three year undergraduate degree where students are predominantly taking coursework leaves little time for a rigorous research project. Research has to be done primarily in the summer and winter breaks when both students and faculty are free. Moreover, by the time a student has developed some research skill, and the ability to work independently, it’s time for them to graduate! Students entering our undergraduate program only have a faint idea about how science is done, and don’t think they themselves can be scientists! But after they have spent a year working on a research project, they begin to understand various processes that go into research such as, identifying a problem, developing different ways to tackle the problem, and collaborating with people with different expertise. Students also realize that science need not always be complicated and expensive, and often the elegance of an experiment lies in its simplicity. The liberal studies setting enables students to interact and learn from their peers, as well as faculty from other disciplines. For example, two students working on the biology of social spiders talked to an economist on campus, and are now learning to use agent-based modelling to visualize the rules that the spiders use to build a web. 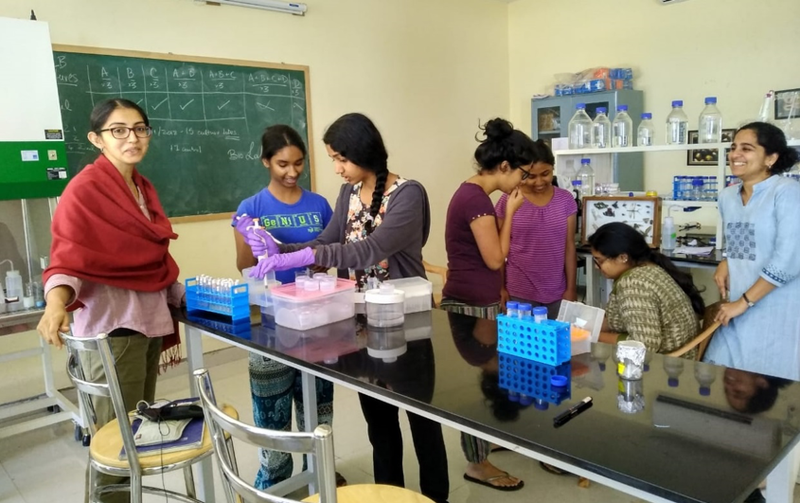 Recently, the first batch of BSc Biology students graduated from Azim Premji University. Some have gone on to the top research institutes within the country and abroad, while others have chosen paths in the teaching profession - the range is wide. Whatever their choice for the future, their research experiences have provided them the right tools to look at real world problems more critically, and engage with them at a different level. As young faculty, such a research environment has challenged us in unique, exciting ways, and importantly shown us a new way of thinking about how to do research and how to choose new problems to tackle. Did you like this article? Please let us know in the comments below.